After a solid month of bullet journaling, Ol' Myrt here as a few things to share. I've found the concept of keeping a bullet journal has in fact kept my office desk cleaner than before - mostly because all my notes go in one place. I've discovered if I keep my "sticky notes" on pages in my bullet journal, in chronological order, my computer monitors look less intimidating. The monthly calendar page has worked well for both long and short term goals. 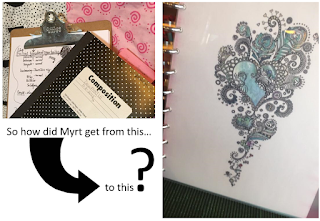 However, Ol' Myrt here doesn't spend a lot of time designing pages, doing zentangles and inserting embellishments, unless I am doodling while on the phone, etc. I have a supply of my lined 8.5x11" paper ready to grab when I need a new page. I use my lined paper each day before I hole punch pages and insert on the Levenger rings. That way those darn rings don't get in the way. That way I can use the pages on a clipboard, say for green room show notes before a hangout. These are the links to the front and back side of my lined pages, with room for the hole punches on the correct border.